...card that is! Isn't this paper scrumptious? I just love it! The Designer Series Paper (DSP) is from the new Razzleberry Lemonade DSP pack. The card itself was pretty easy to make. This is another one from my New Catalog Open House. I used a Whisper White card base and punched the scallop edge. I adhered a strip of the DSP to the inside edge. The 'image' DSP (yes, this paper is pretty enough to be a focal image) is layered onto Rich Razzleberry card stock. I wrapped a length of Rich Razzleberry Polka Dot ribbon around that and added a handmade embellishment (I'll explain that a few lines down). 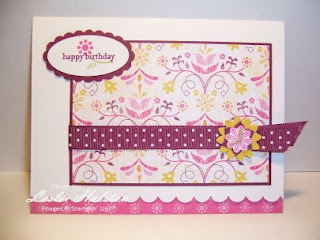 The "happy birthday" sentiment is from the Teeny Tiny Wishes set (I'm loving this set and its versatility). I added the flower from the Razzle Dazzle set over the sentiment...just gives it some extra pizazz...then I punched it using the large oval and layered it onto a scallop oval punch. Note: The Razzle Dazzle set images coordinate with the Razzleberry Lemonade DSP so nicely! Okay, the handmade embellishment...I originally had placed a button there. The button just wasn't doing it for me so I grabbed the Boho Blossoms punch and started playing. The stamped flower is in the Razzle Dazzle set and it fits perfectly into one of the flowers in the punch. My flower layers are in Crushed Curry, Rich Razzleberry and Whisper White. I punched a 1/16" hole in the center and used linen thread to attach it all right to the ribbon. I like this much better than the button I had there. AND, it used some of the scraps I had out on my desk already! So, don't be afraid to make your own 'buttons'. Have a blessed day. I'll be back tomorrow with more from my Open House. On a side note, the boys and I went to see the new Transformers movie yesterday. We loved it!